Often, one of the greatest challenges a patient with vasculitis faces is receiving a definitive diagnosis. Patients often spend months or even years seeking a diagnosis or worse, living with a misdiagnosis and ineffective treatment. The Vasculitis Foundation also recognizes that there are many health care professionals who have MADE the diagnosis of vasculitis, and we want to honor them for their efforts to care for our patients. 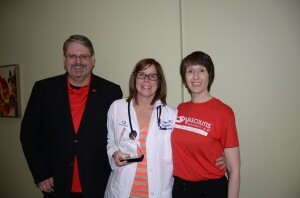 It was a combination of frustration at pediatric experts missing her son’s disease, and the desire to recognize and reward those doctors who do make an early diagnosis of vasculitis, which led Karen to propose the VF V-RED Award. Hirsh developed the award to recognize and reward those health care providers who made an early diagnosis of vasculitis in a patient. Each year the Vasculitis Foundation solicits patients in the vasculitis community to nominate a doctor who made an early call on their diagnosis. The 2018 V-RED Awardee is Dr. Linda Brady, a pediatrician with Old Harding Pediatric Associates, Vanderbilt University Medical Center/Monroe Carrell Jr. Children’s Hospital, Nashville, Tennessee. Dr. Brady was nominated by Lisa Crabb the mother of Chip, who was diagnosed with Granulomatosis with polyangiitis (GPA/formerly Wegener’s) in September 2017. 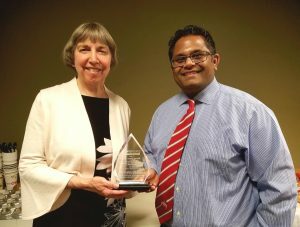 Dr. Samir Parikh was nominated by Sandy Nye, who was diagnosed with Microscopic polyangiitis in 2014 after being sick for more than five years with no definitive diagnosis. Dr. Parikh, a nephrologist, made the diagnosis in four weeks after performing a kidney biopsy and recognizing the symptoms of vasculitis. 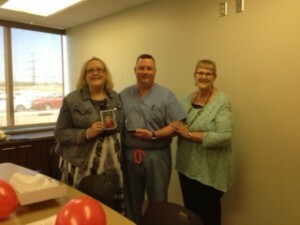 Dr. Daniel Watson was nominated by Nicole Shankey in recognition of his diagnosis of Granulomatosis with polyangiitis (GPA/formerly Wegener’s) after an emergency room visit. Dr. Watson, an otolaryngologist, suspected the rare autoimmune disease after seeing Nicole during the ER visit. He recommended a course of high-dose steroids instead of an emergency tracheotomy. 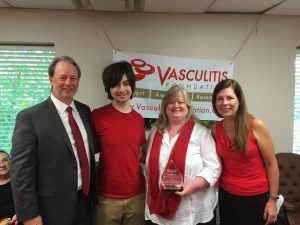 David Tait, a resident of New Canaan, Connecticut, nominated Dr. Seth Sullivan for the VF’s 2016 V-RED Award believing that it was Dr. Sullivan’s early diagnosis of vasculitis that gave him a more positive health outcome. In 2014, after suffering a heart attack, Tait was taken to the Norwalk Hospital Emergency Department where he was placed under the care of Sullivan. Dr. Sullivan said that as a hospitalist he reviews each patient’s prior medical history and test results. He becomes a clinical data detective looking at all of the patient’s medical records for diagnostic red flags. In David’s case, it was an unusually high eosinophil count that captured Sullivan’s attention. Based on his findings, Sullivan was able to diagnose Tait with eosinophilic granulomatosis with polyangiitis (EGPA /Churg-Strauss Syndrome), a rare autoimmune systemic vasculitis. It was Sullivan’s early diagnosis of vasculitis that prevented the disease from progressing and causing more serious organ damage. Tait was immediately treated with prednisone and Cytoxan, which are standard therapies for vasculitis patients. 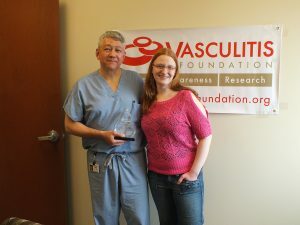 Kate Kinney, Monroe, Wisconsin, was nominated for the VF’s 2016 V-RED Award by her patient, Michael Gunderson, a resident of Davis, Illinois. Gunderson was suffering from chronic symptoms that included severe sinus infections, joint swelling, and fatigue. When the symptoms grew worse and didn’t respond to multiple courses of antibiotics, Gunderson went to Kinney who works as a hospitalist at the Monroe Clinic. Kinney and her medical team analyzed Gunderson’s medical history to search out a possible underlying cause for the chronic symptoms. She got a clue from Gunderson, who told her that an ENT once suggested he might have vasculitis, a rare autoimmune condition whose symptoms can mimic other common illnesses. However, numerous specialists who saw Gunderson didn’t suspect anything unusual. What Kinney ultimately discovered from a lung biopsy was that Gunderson’s condition was anything but ordinary. She confirmed that Gunderson did have a rare, and serious autoimmune condition called Granulomatosis with polyangiitis (GPA/Wegener’s) vasculitis. The disease affects the upper and lower respiratory system and frequently involves the kidneys, lungs, eyes, ears, throat, skin and other body organs. Once Kinney made the diagnosis, doctors were able to begin the standard therapies to treat his vasculitis. Gunderson credits Kinney’s tenacity and team-centered approach to her work as a major factor for catching the rare disease before it could cause further damage to his health. It is not unusual that a medical specialist is one of the first doctors to see a patient suffering the early onset of vasculitis symptoms. This was the case for Jodi Resnac, who was under the care of Dr. Jeffrey Raines, a general obstetrician/gynecologist and supervisor for the Obstetric/Gynecology Department of Fairview Medical Group in Kingsman Arizona. Dr. Raines explains that in his role as Jodi’s obstetrician he was responsible for her care and the eventual delivery of her baby. During a routine testing of her kidney function, Dr. Raines caught a red flag. Jodi was showing protein excretion in her urine (proteinuria) which isn’t necessarily unusual during pregnancy. However, in Jodi’s case, it was happening much earlier than normal. Jodi remembers the appointment when she got the diagnosis started out normally, but turned serious as Dr. Raines shared his concern over her tests. “He sat me down and told me he had run some tests because he had seen an abnormal amount of protein spilling into my urine,” Jodi recalled. “I also tested positive for the ANCA test. He gently said he was suspicious that I had a treatable auto immune disease called Wegener’s granulomatosis. Jodi immediately contacted her mother, Jan Petersen, with the news. It was particularly devastating to Jan because she was familiar with the disease. “When Jodi told me the news, I knew exactly what she was talking about because my sister had had a series of five collegian diseases from 1975 until her death in 1981. Wegener’s being one of them. When Jodi told me the name of the disease, I just put my head on my desk and tried not to cry,” Jan said. Jodi began treatment for vasculitis with prednisone and methotrexate. Since her diagnosis in 2003, Jodi’s team of doctors grew as she dealt with complications from the vasculitis. Today, her creatine level is normal, and she hasn’t experienced any flares. Click here to read about our 2015 Awardee. Click here to read about our 2014 Awardee.